Today is the anniversary of the arrival of a brigade of US marines in Iceland: 8 July 1941. The American task force was assembled in Charleston, South Carolina, and sailed for Newfoundland and then on to Iceland. The Icelanders welcomed the US troops, who were taking over from the British force that had invaded the island in May of that year to preempt a perceived attack by Germany. 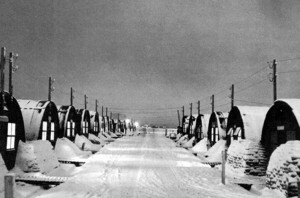 The Americans remained in Iceland for the duration of World War II. This entry was posted in Vignette and tagged Camp Pershing, Iceland. Bookmark the permalink.